Flickli - the patch! 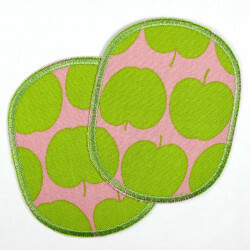 plaster sweets, iron on patch, Flicklis - specially reinforced fabric patches, perfect as a knee or elbow patches suitable! Patches Flickli embellished patch candy and mends your pants or jacket and makes it a very special designer piece. But also on the denim jacket the applique is excellent and makes the clothes patch is definitely an eye catcher. Using as hotfix is really easy. Follow the simple iron manual please.